Indeed.com is a website that gives job seekers free access – instantly, in a single search – to millions of jobs from thousands of company websites and job boards. With this data, Indeed also reports on job trends in job postings per capita, job market competition, and industry employment trends. Is it difficult for your applicants to find work? 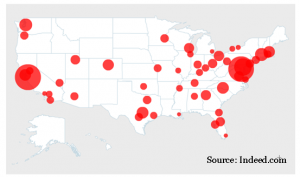 Indeed reports job postings per capita for the 50 most populous metro areas. According to second quarter 2010 data San Jose, CA and Washington, DC rank at the top with 132 and 129 job postings per 1,000 people. Meanwhile, New Orleans, LA and Miami, FL rank at the bottom, each with per capita job postings of 20. If you’re an employer located in cities at the top, bottom, or even somewhere in between has implications for the reason you need employment screening and background checks. When jobs are scarce employment screening has an impact. When jobs are scarce, as in New Orleans and Miami, you may find yourself with a slew of resumes for a given job opening. In these cases, heavy competition among job hunters may drive applicants to stretch the truth (or outright lie) in order to land a job. On a positive note, employers have access to a wide pool of talent when jobs are scarce and are therefore afforded the opportunity to “screen in” the best possible candidates. Build up a workforce with the best available talent by using employment screening to thoroughly check the background of your applicants. Avoid being duped by an applicant’s false claims by verifying the qualifications and statements of your applicants. 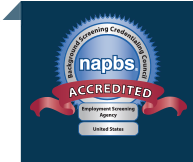 Even when jobs are plentiful employment screening matters. Meanwhile, in areas like San Jose and Washington, DC where jobs are more plentiful employers are likely to face greater competition for a much tighter field of available workers. Some would argue that applicants in this setting require even greater scrutiny since many of the most qualified workers will already be employed. As such, a thorough background check of your candidates is in order to ensure you select a candidate with the necessary qualifications. Ensure (at least) the minimal qualifications are met by verifying the qualifications of your applicants. Increase the quality of your applicants by encouraging applicants to be truthful about their past. Enhance workplace safety by assessing an individual’s risk based on prior records or behaviors. Increase productivity by verifying the qualifications of your workers. Reduce turnover by hiring the right person, the first time. Encourage a drug-free workplace by screening for substance use. Make informed hiring decisions by knowing more about the people who will join your workforce. Whether you’re an employer in Washington, DC or Miami, FL the right employment screening strategy can give you an edge in building a safer, more qualified workforce. Learn more by requesting a meeting with one of our consultants. Or get started by opening a background screening account.